My husband, as amazing as I think he is, scored 0% for his auditory skills on a learning styles assessment. This has nothing to do with intelligence. It has everything to with how a person takes in and retains information. After he took the learning styles assessment it all made sense. I became a smarter communicator by changing the delivery mode for any pertinent decisions or content we had to discuss. I switched to texting, messaging, and emailing for appointments, schedules and reminders. It worked! He would give his confirmation and feedback via the same channels. It also gave me physical proof to show him in case he said, “I forgot.” He he. Well, he did. 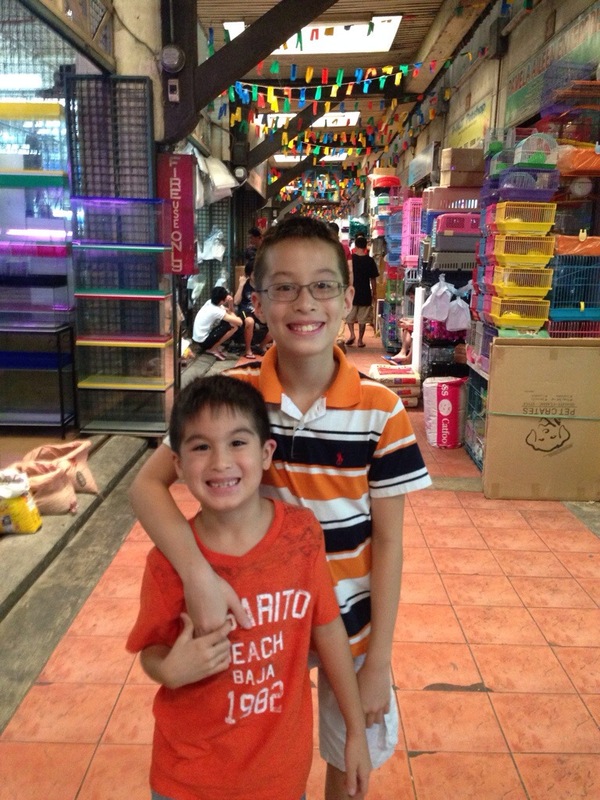 The day that Edan turned 8, Edric booked five major meetings. I found out while I was lying in Edric’s arms sharing a moment of sweet exchange about how much we missed one another. It turned pretty sour for me when I found out that Edric had left no room in his day to spend with Edan like he said he would. For Edan’s sake, I felt hurt and disappointed. 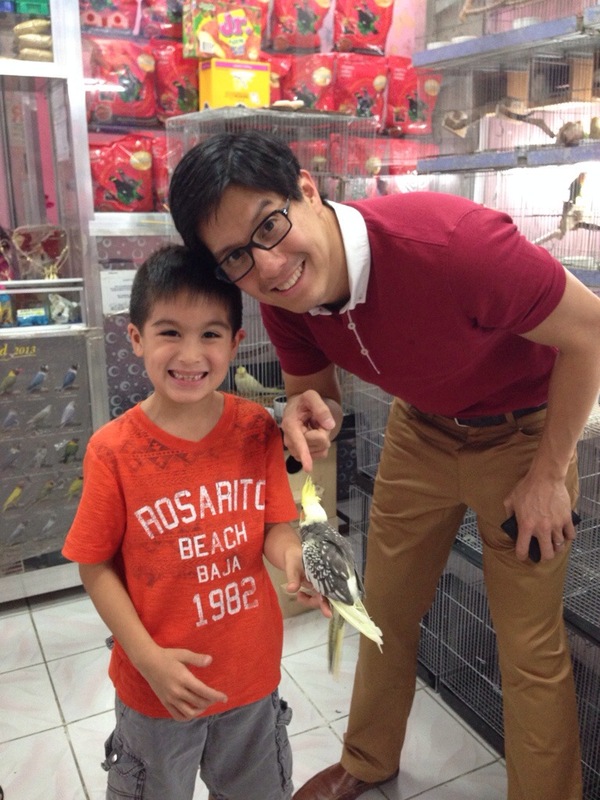 It turned out that Edan wanted to go to the pet store with his dad to buy a falcon. Okay…a falcon. Where would we find anything remotely close to a bird of prey?! Obviously the falcon was a fantasy of an idea. He was willing to settle for a bird that he could put on his finger and hold. Edric and I were pretty confident that Cartimar would have something that matched that description. When I discovered that Edric had back to back meetings I thought Cartimar would have to be postponed. But Edric was convinced that he could find a way to get there and back and still make his meetings. I was pretty doubtful. Cartimar wasn’t around the corner. It was in Pasay. Nevertheless, I kept things optimistic at home for Edan’s sake. He approached me several times to ask, “What time are we going, mom?” Buying that bird was like the dream of all dreams for him. But I had to wait on Edric to do some magic with his meetings. By 11:30 AM Edric picked us up and we headed to Cartimar. And there was no traffic! We were in and out of Cartimar in about two and a half hours, and Edric even joined us for a late lunch. Of course we didn’t get Edan a falcon like he originally wished for. He was willing to settle for two cockatiels. One he named Beady and the other, Geedy. 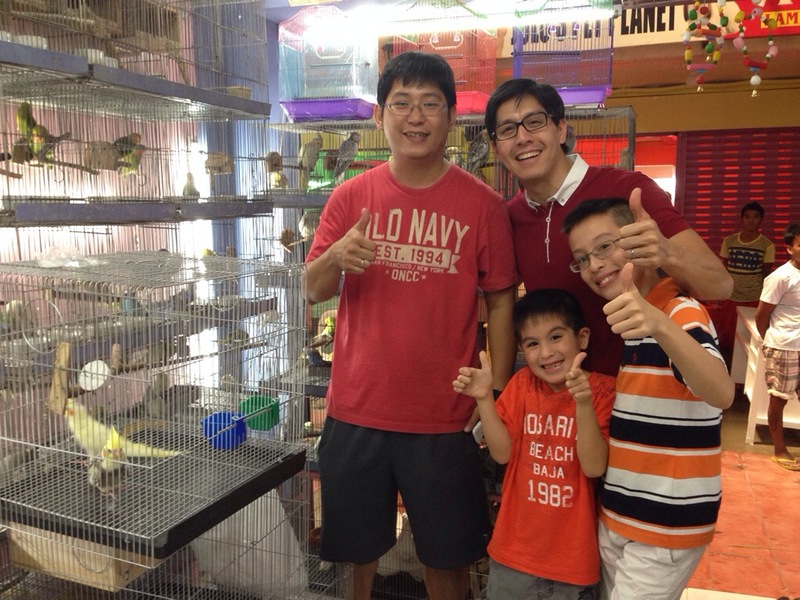 A side story…In Cartimar we ran into a friend of Edric’s family who was a pet store owner himself (for dogs) and he helped us negotiate the price of the cockatiels. He was God-sent. Normally, he wasn’t around but he happened to be there that day. So we knew that we weren’t getting duped as rookie bird buyers. Edan developed an immediate attachment to his new pets. As for me, I was so impressed with my husband. First he displayed some pretty attractive bargaining skills. But more than that it was following through with his commitment to Edan that really blessed me. Edric found a way to slide his afternoon meetings upwards. 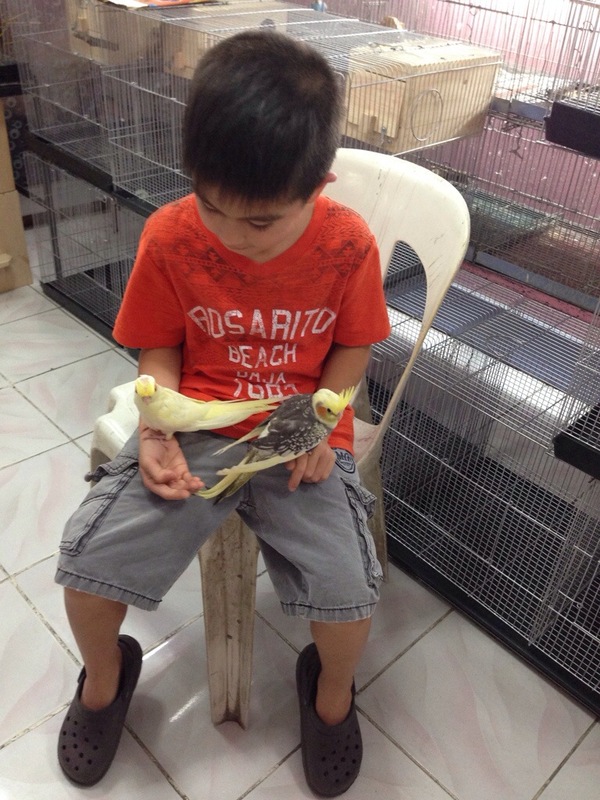 I know Edan was thrilled to get his two cockatiels. (As I am writing this he is with them at home, acting the part of loving parent.) But the joy he felt when he picked out those birds wouldn’t have been complete if Edric failed to be present. I know Edan. He might have taken the big let down like a toughie but it would have curdled inside him, and his countenance would have shown it. Sometimes parenting can seem so complicated. I get all kinds of questions from friends and readers about how to deal with difficult children. And I know what it is like to be confronted with character issues in my own kids. But it’s really not that complicated. When my kids start acting up, character-wise, I know it is often a deficiency on the part of Edric and I (in the area of our parenting). I am not saying this is always the case but our children tend to be responders. The way we raise and treat them; what we model, praise, hold dear; how we communicate that we love and cherish them, these make impressions that lead to desirable and undesirable behaviors and attitudes on their part. Edan’s heart, like all my other children’s hearts, is delicate and fragile. It would have been deeply wounded if Edric had not prioritized him on his birthday. Edric didn’t need to spend 24 hours with him to make him feel significant. Two and a half hours to and from the pet store, and the prize of two cockatiels in a cage were enough to send Edan to the moon. He felt really special. A father’s time and attention will do that. I see how hard it is for Edric to balance everything he does. It’s no easy juggling for him to be a husband, dad, TV host, motivational speaker, director of a homeschool program, head of family ministry, and discipler and mentor to other men. But somehow he is able to be around when it matters most. He knows that a father’s priority is his family, and his children know for certain that they are. I pray that Edric will remain this way. It’s only by God’s grace that he is this kind of a dad to our kids. But he is going to be a dad for a very long while yet, and there will always be something competing with his priorities. The same goes for me as a mother. Edric and I have to continually ask ourselves, what must have precedence in our lives according to God’s word? As I watched Edan delightfully engrossed in the responsibility of caring for his birds, and listened to him chatter away as he described their personalities…Geedy is “stubborn” and “wakes up early”, and Beady “eats all the food” and “likes to sleep”, I was reminded that it is always worth it to communicate to our children that they are the most important people in our lives. Actually, i just need someone to pray for me and for my family… While reading the last part of this post.. my tears starts to fall tlg…exactly sa word na “PRIORITY”. Me and my husband got married on January 12, 2013, we’ve met on May 2012. I believed that this marriage is a Divine appointment tlg.. at kaloob tlg ng Lord. Sometimes I even asked God kung bkt siya ang ibinigay sa akin sa dami ng Christians sa mundo… well I prayed for a partner na di lng basta asawa but my partner in knowing God intimately and to have a genuine relationship sa Lord. And thats how the Lord answered me back everytime… He is my answered prayer.. But i felt na something is wrong with us as a couple.. we dont communicate as partners normally do..
and I nver felt na I was/am his priority…. actually, sa 30th birthday ko and i know na wala nmn siyang plan to celebrate it… like what happened last year.. kc ang plan niya on the 29 is to go to a certain place to minister sa mga needy… as usual.. di ako ang priority… and am starting to expect nothing from him n rin nmn.. to lessen the disappointment. There are a lot to tell.. pero as of now… that how i feel… and im on the edge of breaking down.. it is only by the grace of God na am still thinking positively na magiging okay kmi… Im desperately needed a prayer…thank you.. by writing this.. medyo na-relieve ako.. 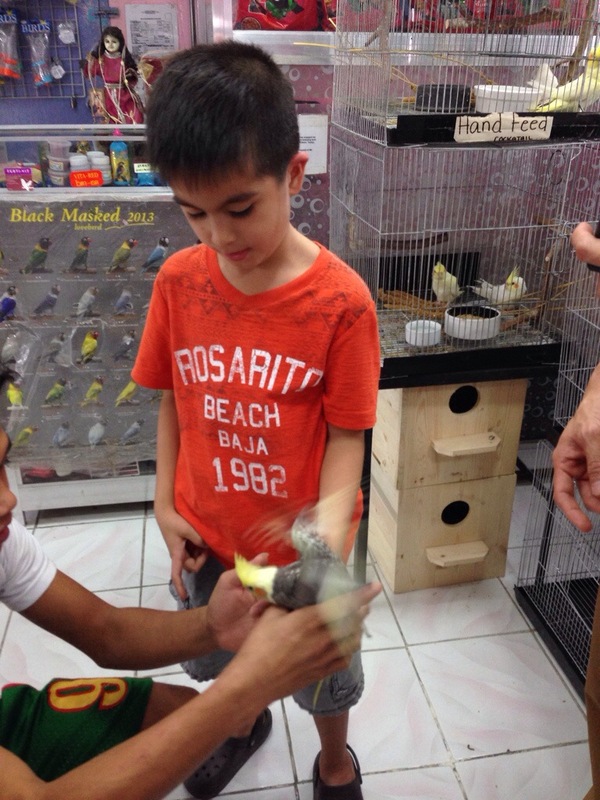 I wanted to give my nephew a pet bird on his coming birthday , he told me he wanted to have a pet and when i asked what kind, he said a bird, and i remembered your blog, i just wanted to ask the name of the store where you bought it.